The first 6 stories told of the rise of the human race in the 23rd century. Like most stories, it's character driven. The main character is called DL Bradley, an officer in the Terran Alliance. As the 23rd century is nearly ready to dawn, the humans have been trying to form a United Planets with the Drengin Empire, Arceans, Altarians, and Torian Confederacy. And for a time, they are actually successful. All of the 5 major civilizations are part of it. At this stage, there is no hyperdrive. Ships travel purely via the star gates. And the Drengin and Arceans had been operating in the galaxy through star gates for nearly a hundred thousand years. And the Drengin plan to attack the Arceans had been in motion for over 50,000 years. Since any attack could be thwarted by simply shutting down the receiving star gate, the Drengin hatched a plan to have unmanned drones literally tow via normal space star gates that would be parked within the solar system of Arcean colonies. So the arrival of the Terran Alliance at the dawn of the 23rd century and their attempts to build an interstellar coalition of friendship, commerce, and trade was more of an inconvenient distraction for the Drengin. They weren't about to give up their ambitions. The Drengin had, by far, the largest military in that part of the galaxy (little at this point is known about the rest of the galaxy). So the Drengin star gates finally arrive at their destinations in 2178. They then proceed to launch their massive attack against the Arcean colonies. The Arceans, of course, are taken by surprise and lose control of a couple of their star gates. As a result, most of the Arcean Empire is obliterated. The Arcean home world and one other colony are all that remain. Meanwhile, not all is good on Earth. Human culture has gone through a great deal of soul searching over the past 100 years. On the one hand, humanity had put itself up as the diplomats and merchants of the galaxy. But on the other hand, the Terran Alliance had put together a fairly lethal, though small military which protected that commerce. In fact, many of the minor civilizations such as the Korx and Vegans simply shipped their goods aboard Terran Alliance merchant ships since they could count on their deliveries being safe from piracy due to the protection of the Terran Alliance navy. Mind you, the Terran Alliance military was nothing compared to say the Arcean Empire's let alone the massive Drengin Empire star navy. But it was a potent little force all the same. The leadership on Earth had little inclination to build up beyond this. After all, the United Planets would take care of any disputes in the future. War was a relic of the past. This caused some issues with some of the officers in the Terran navy who wanted to see adventure and glory. One such person was Lorina Gates who was top of her class. Many humans served as advisors to militaries on a variety of worlds because as nice and peaceful as humans seemed to be, they were considered by many the best tacticians in the known galaxy. However, no humans served as advisors to the Drengin Empire. It was the ambition of many naval officers to be considered so excellent that even the Drengin Empire would want their advice and instruction. As the war between the Arceans and Drengin went into a stalemate (because of the limitations of the star gates), Drengin intelligence discovered that the humans had come up with a new type of drive system that would make the star gates irrelevant -- Hyperdrive. The humans even had a prototype ship called the TAS Defender. The ship even had a new type of defense called shields. While all the other ships in all the other militaries defended their ships using various types of armor vs. various kinds of plasma beams, the humans had come up with a way to make their ships largely invulnerable against that type of weapon. It was believed that the TAS Defender could probably take on, by itself, a half dozen Drengin Battle Cruisers. If the humans built enough such ships, they could completely alter the balance in the quadrant. The Drengin needed to get that ship and learn its secrets. Lorina Gates was not aware of any of this. The Drengin appraoched her and said that they were indeed impressed with her accomplishments but that they did not trust humans to not be spies. They want someone who was totally loyal to them. Lorina was willing to do anything to demonstrate her worthiness. The Drengin seized on this and told her that she would need to steal the TAS Defender and deliver it to them. She was not told of the special nature of this ship. By all accounts, the ship was not that remarkable. Its weapons were a bit better than most but it was much more lightly armored than the typical ship (since it had shields but she didn't know this). But they needed to know that she was fully committed to this. Since Earth had become a decadent pacifist, from her point of view and the war with the Arceans could have ended at any time, she made her choice and sealed her fate. She, and some other like minded cadets stole the ship. Not knowing of its Hyperdrive capabilities meant that they literally had to take the Terran star gate network to get to Drengin space. After doing battle with the TAS Vanguard, an older but very heavily armored ship, the Defender was nearly ready to get away when a Lt. DL Bradley took command after the death of the captain and was able to send a signal to the star gate to malfunction before the Defender could escape. At this point, the Vanguard crew, far outnumbering Lorina's crew, boraded the Defender. Lorina was able to escape through a shuttle pod through the star gate still. But the Defender was back in the hands of the Terran Alliance. The Drengin then declared war. The first 3 books outline the Drengin war and introduce readers to the mysterious Arnorians (the Arnor). The 4th story, Twlight of the Morningstar, tells of the fate of one Arnorian who was helping the humans. The last two stories deal primarily with the Yor and tie the rest of the stories together, introduce the Iconians and Thalan and resolve the various plot lines. I won't go into too much detail on those because Galactic Civilizations III will borrow heavily from those particular stories. The other 3 stories take place long long before there were even humans. It deals with how the universe got started in the first place. And it fully explains why the Altarians and the Humans look so similar. The first story deals with how the Arnor came to be as well as how they split into two groups. The Arnor were a flawed creation. Their maker could not decide how best to go about creating beings of incredible power to help guide the rest of creation. The maker of the Arnorians was one of the 5 Mithrilar. There were originally only supposed to be 4 of them but a 5th Mithrilar came seemingly from another dimension in which the universe was collapsing upon itself. There was something wrong with him but none of the other Mithrilar could quite put their finger on it. He was simply known as the Dark Mithrilar. The first 100 Arnorians that were created were immensely powerful and made in the image of the dark Mithrilar. The next 1,000 Arnorians were similar but less powerful. And then the next 10,000 were generally less powerful but had two significant differences -- they could reproduce and were insensitive to the passage of time. The dark Mithrilar was different from the others of his kind because he could sense the passage of time. A great deal of time is spent considering the significance of that -- ever imagined living 1000 years? What about 10,000 years? What about a million? Even if you were in perfect health, how long before you went mad? The dark Arnorian had long gone mad because of this. But not so mad that he didn't recognize the source of his pain. For a long while, the Arnor were content. But time would do its work. The Arnor that were sensitive to time slowly became twisted as thousands and then hundreds of thousands of years passed while the other Arnor were completely oblivious to it. Most Arnor could sit down and ponder a mountain and watch plate tectonics in action. They could sit motionless that long because they had no need for food or sleep and time meant nothing. Eventually the twisted 1,100 Arnors began preying on the rest. They found a way to drain the power from the lesser Arnor and put it into an orb-like device. This device became ever more powerful as a result of the leeching of power from the lesser Arnor. In time, the Arnorians fought back and named their oppressors as the Dread Lords. Or more specifically, the 100 most powerful were the Dread Lords and the rest were simply Dread Knights. In the end the Dread Lords were defeated and the few that remained driven off of Arnor. But the remaining Arnorians were a shadow of what they once were. Ironically, this story is told as a story by an Arnorian who is found on an alien world called Altaria. A cataclysm had occurred and changed all of existence and the dark Mithrilar, called Draginol (that's the source of my on-line handle btw), was also on Altaria. The second two stories deal with the Altarians trying to resist the evil Draginol and his forces and the aid of Mascrinthus, the last surviving Mithrilar other than Draginol. The ending of this actually sets in motion the original stories creating a loop. 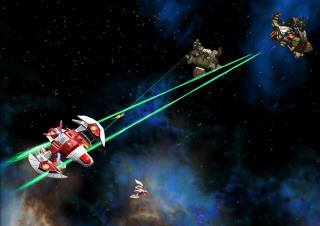 For a strategy game, the characters no longer were central to the story. People create their own characters in their games and the civilizations themselves take center stage. The Drengin Empire and Arcean Empire have been powerful space faring civilizations for eons. The Torain Confederacy was once enslaved by the Drengin Emprie. The Korx are still the vile but ultimate capitalistic society -- laisser-faire taken to the Nth degree. We wanted to create a universe where the Terran Alliance are at a cross-roads. Those clever monkeys from Sol III are pretty darn good at killing stuff but they seem to almost be over compensating by trying to be nice, diplomatic, and polite. The Terran Alliance had a weapon that none were familiar with -- pop culture. Their influence tended to spread far from their borders. There's nothing more frightening than seeing a Torian wearing blue jeans. Which path players want to take the Terrans is up to them. And in Galactic Civilizations II, they can take charge of any of the 10 major civilizations or create their own unique one. So do you play the Torians and go for vengeance against the Drengin? Do you play as the Thalan who have come from the an alternative future that exists in the Galactic Civilizations III timeline and snuff out the Terran Alliance before they destroy the universe? Or do you play as the evil Drengin who want to conquer everyone because skin is so good and variety truly is the spice of life. If you didn't play the first Galactic Civilizations, you didn't miss much from a story point of view. We just didn't have the budget. I would love to go back and do something about that but that will have to come at some other time. The humans discover hyperdrive and the technology leaks to the other major civilizations in short order. Now they must race to capture planets. However, during this race, the Drengin begin to recognize a threat in the humans. The humans behave like they just want to unite the galaxy in peace and trade. The Drengin secretly prop up a minor race known as the Xendar. The Xendar become a pretty formidable military threat and launch an invasion against several human worlds. The goal of the Drengin was to keep the Terrans down and to make clear to the others, particularly the Arceans and the Altarians, that teaming up with the humans would be folly. After the events of the Altarian Prophecy where the humans showed some military ability against the Korx and Drath in a handful of skirmishes, the Drengin weren't sure what would happen with the Xendar. The Drengin made sure that the Xendar had the latest Drengin military hardware (disguised) and the Xendar themselves were a fierce warrior society. The only reason they weren't a major power was because they simply did not get their hands on hyperdrive until too late. Otherwise they'd have been one of the major civs. But then the humans did something that the Drengin totally didn't expect. The Humans crushed the Xendar ruthlessly. The Terran Alliance wasn't a paper tiger after all. Worse, the humans were cunning in a way that the Drengin had not seen in other civilizations. The Terran military didn't attack with savagery or brutality. The Terran navy worked like a surgeon cutting the Xendar to pieces. Within two years, the Terran Alliance had absolutely brought the Xendar to their knees. Before the Xendar could tell the humans the Drengin's involvement, Drengin agents unleashed a long prepared neural toxin into the air of the Xendar home world killing every Xendar on the planet. The Xendar are now all but wiped out and not an issue at this stage. Those that exist in the galaxy blame the humans. The Drengin now knew, however, that the Terran Alliance had a steel fist inside their velvet glove. They were wolves and sheep's clothing. But they were also a very young race and not that powerful yet. Given time, however, and the humans could become the ultimate power in the galaxy. The only way that could happen is if they were given the time to become dominant. The Drengin's plan to stop this was to first remove the Terran's friend -- the Arceans. Then the Altarians would be next and finally the humans. Left on their own, the humans simply hadn't put together the economic or industrial might to compete against the Drengin Empire. In 2225, the Drengin were set and the war was launched against the Arceans. But the humans did something unexpected -- they voluntarily came to the aid of the Arceans. No treaty. No obligation. They simply aided the Arceans against "aggression" which the Drengin simply can't grasp why anyone would do that. Galactic Civilizations II is the main event. The story of the Drengin / Human war and the return of the dark Arnor. We hope you like it. *claps* Awesome! Truly awesome. Answered a large number of questions I had. The Drengin had, by far, the largest military in that part of the galaxy (little at this point is known about the rest of the galaxy). So hopefully the story could expand into more of the galaxy, perhaps with new races? Go Humans! I love a good scifi story that puts Humans in a good (but realistic) light. Interesting fact: many scientists believe that the reason Neanderthals fell to Homo Sapiens so quickly is linked to the fact that Neanderthals appear to have had little or no sense of deceit. They possibly saw things only as they were, with almost no concept of 'what could be' or 'what is not,' much like people affected by autism. This could be why we've yet to find significant Neanderthal art; they may have been unable to create art because they could not deceive. The one thing that puzzles me about all this story is fusion. Humans have been an industrialized society for only a few hundred years; the older races have been spacefaring for tens of thousands. How is it, then, that only humans ever managed to pull off fusion-based energy production? Wouldn't other races look at their suns and come to the same conclusions we have? Or, if we just happened to be reckless and creative enough to figure it out when other races didn't, shouldn't that mean (in-game) we should have some crazy huge research bonus? Just some questions, and regardless of whether I get that part or not I like the story. And I'm looking forward to playing the game a lot. I don't know Brad. You might be good at making games and other software, but I think you might have missed your calling as a storyteller! I have to admit that this is one of the most compelling backstories I've ever seen for a sci-fi game of any sort (strategy game or otherwise). I especially enjoyed the story of Lorina Gates, Lt. Bradley, and the attempted theft of the TAS Defender; even if it was only the condensed version. Either way, though, it was a good read--all of it. Great story. Ever thought about making a book out of it?! Interesting fact: many scientists believe that the reason Neanderthals fell to Homo Sapiens so quickly is linked to the fact that Neanderthals appear to have had little or no sense of deceit. They possibly saw things only as they were, with almost no concept of 'what could be' or 'what is not,' much like people affected by autism. This could be why we've yet to find significant Neanderthal art; they may have been unable to create art because they could not deceive. While this is a very interesting hypothesis, it unfortunately is based purely on surmise. Bear in mind that for 90+ years we thought that the Neanderthals had no ability to speak due to a lack of ascending pharynx.... finally someone with an open mind got round to looking at the remains of a number of Neanderthals and concluded that we had just put the bones together wrong and there was plenty of room for an ascending pharynx. When it comes to autism-like cognitive function, this is entirely speculation as it is indetectable from cranial remains, you would need real brain matter to see this. As for no cave art.... well, judging intelligence based upon what we deem to be so is innately flawed. Neanderthals definitely had the capacity for symbolism as can be seen from burial sites with repeated positioning and grave goods.... they had some kind of idea of a next life. Similarly, trying to determine what they knew; could postulate; could not grasp etc is way beyond the bounds of proof and more fitting for a fiction novel. In my opinion, bear in mind that while I am a qualified anthropologist, this isn't my specific area of study..... Neanderthals were never truly wiped out but probably interbred with homo sapiens sapiens: they were definitely biologically compatible and nowhere near as different looking and fugly as they have been portrayed to be. If you look at changes to European homo sapiens skulls post cro-magnon man, you will see that some quite serious modifications took place in an incredibly short period of time. This, to me, lends weight to any hypothesis revolving around inter-breeding! Anyway, I just wanted to put my two-penneth in....... I will shut up and instead laud praise on the fine backstory..... it's definitely given me a better appreciation for the relationship between races and I will be especially watchful for those nasty Drengins in my games! As someone who constantly enjoys sci-fi games, especially ones that allow me to come up with my approach to the stories. I say bravo. I liked your work. And obviously were getting the hyper condensed versions. I just have to say, cool stuff. Now I'll just get back to working on my own sci-fi stories. (Which I will of course play some via GalCiv2.) Heheh.. I assume it's impossible for the general public to read those original 9 manuscripts ? it would be very good if in a future bonus pack could be included a video of 20-30 mins which tells all history behind galactic civilizations. i don't know if it will be possible but probably will be the best bonus pack we could obtain from stardock. if other people like the idea we could make a poll where we demand stardock to do this specific video as a future bonus pack. P.S. : I'm not good in programmation or informatics so i don't know if doing a video like it would request too much time and resources for stardock, so it's totally insane to do it in a bonus pack. Great story, nice pictures too. I wish there was some sort of tech demo on GC2 so I know if it will work on my laptop. If The Movies(Lionhead) well, will GC2 also work well? I want to buy it on release. More then likely. The requirements to run GalCiv2 itself are pretty low. It's when you turn on all the graphics widgets that you have to check. If it can do The Movies.. then it can probably do Gal Civ 2. I have to say, every time you write, chills go up and down my spine much like the ones experienced while watching the trailer for GC2. Some folks call this "When someone walks over your grave effect", I think of it more as the WOW factor. That is great to hear. I do have DX 9.0c compatible card at least (it's a lowly ATI X200 128mb) but the 1gb ram should help. I don't mind the lack of mp facilities. I want this type of game to play during breaks or when travelling. CIV4 was too heavy (it ran but too slow). I have been a Sci-Fi junkie since I was 6 years old, watching the orignal Star Trak, playing the original Galac Civ on OS/2. I even tried my hand at written, suffice to say I was not good at it. Marcusjm you have an ATI X200 128MB video card and 1024 MB RAM, but what CPU? The Beta 5 runs fine on my system with 4X AA (Intel Hyper-threaded 2.8GHz CPU, NVIDIA GeForce FX 5200 128MB video card, and 512 MB RAM). It''s a Sempron 3000+. Not the fastest but anything else would cook my laptop . Rome Total War works pretty well too btw. "So do you play the Torians and go for vengeance against the Drengin? Do you play as the Thalan who have come from the an alternative future that exists in the Galactic Civilizations III timeline and snuff out the Terran Alliance before they destroy the universe?" How exactly do we destroy the universe? If the universe was destroyed, how did the Thalans have anywhere to come back from to stop us? It says alternate timeline, but if an alternate timeline has already been created, then didn't we *not* destroy the universe? Or do the Thalans just *think* we destroyed the universe when it was really the Drengin or the Dark Arnor or somebody else? Great read there Draginol, I am VERY much looking forward to playing the campaign! !